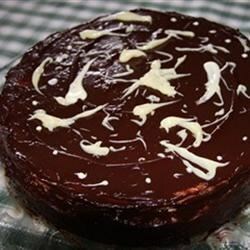 "Chocolate cheesecake with rich chocolate frosting." Preheat oven to 300 degrees F (140 degrees C). Using a fork, combine the melted butter and cookie crumbs. Press mixture into the bottom of a 9 inch springform pan to form the crust. In a large bowl, beat together the cream cheese, sugar and eggs until blended. Pour half of the cream cheese mixture into the crust. Stir 2 ounces melted chocolate into remaining cream cheese mixture, then pour over the first layer. Bake cheesecake on the center rack of preheated oven for 50 minutes. Let cool completely in the pan, then cut around edges with a knife to loosen cheesecake before removing pan sides. In a medium bowl, combine 6 ounces melted chocolate and sour cream, stirring until blended. Spoon mixture on top of cooled cheesecake. Keep refrigerated until ready to serve. Show-stopping cheesecake stars cream-filled chocolate sandwich cookies. Fantastic Dessert Tansy!! It was a great ending to a big meal. I topped it off with some chocolate sauce drizzled over top. Thanks for sharing! Taste was good, but it was difficult to keep the layers separate. Don't mix the frosting too much ahead of time because it hardens quickly. Thanks for the recipe. It was a pretty good cheescake. The tip about the frosting is true...it hardens quite quickly.